Modern in design and dependable to use, the Basic HSE Executive Container (Empty) provides a selection of large and stylish carry cases that safely keep first aid materials free from contamination, so that they stay clean and are ready when you need them. 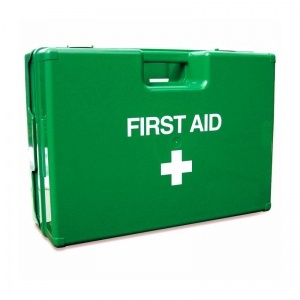 The Executive range of first aid carry cases presents you with the perfect blend of high quality precision construction, with extreme practicality of purpose. Made from great quality acrylonitrile butadiene styrene (ABS) plastic, the exceptionally robust exterior can withstand any bumps and knocks that may occur during transportation. The boxes are fitted with smart twist and lock fasteners that allow for quick opening of the case, which will reveal the removable, shatterproof internal dividers that are designed to interlock with each other, creating innumerable storage combinations. They are perfect for the first aider wanting more options to layout their own case to how they prefer. Each Executive case comes with an integrated handle for easy transportation and a wall mounting bracket to hang in designated health and safety areas. The container is a luminous green that is easy to spot in times of emergency. 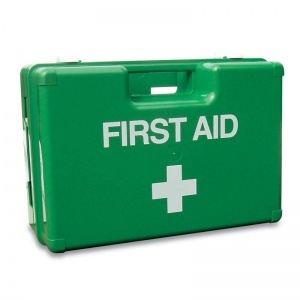 It is available in different sizes depending on the quantity of first aid materials required by your workplace; please see the sizing chart below for more information. 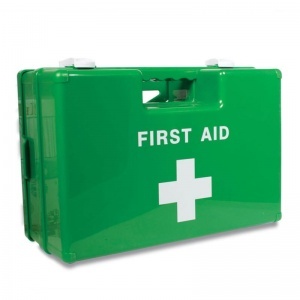 Please be aware that the Basic HSE Executive Container is supplied empty, and that first aid materials must be purchased separately. The Basic HSE Executive Container (Empty) is usually dispatched via First Class Royal Mail and delivery should be within 1 to 3 working days.